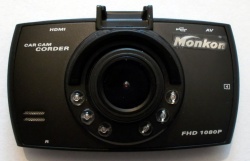 The Monkon New Arrival MT2 is an A20 based "DashCam" (Dashboard camera), which does not even run linux or android from its 8MiB SPI ROM. It is very cheap and very bad for what it is supposed to do, and the reviews on amazon.co.uk are terrible. The Monkon badge was crudely glued on the back of the Monkon rebadged device. Since this hardware is not using a linux or an android, it remains to be seen what can be retrieved from the SPI rom. There is a good chance that support will have to be created from scratch. Remove the 4 tiny screws, and then you can carefully remove the front bezel with your Plastic tool. Start from the top edge (the side without the buttons). This side needs to be moved in, as there are two clips which need to be pushed inwards, and which then easily release from the rest of the housing. The two sides can then be pushed outwards from the main housing, so the clips there release. Rotate the bezel slightly, and the most fragile clip at the bottom of the bezel should give way. Dismantling the rest of the device should now be straightforward. 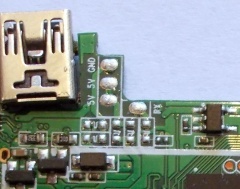 There are 4 pads north of the DRAM module, which are marked: GND, 5V, 5V and RX. The TX is probably one of the 5V lines. Just solder on some wires according to our UART howto. So far, no UART output has been detected. The Monkon is clearly a cheap rebadge job, and will have been sold under a few different guises, and can still easily be found on aliexpress. This page was last modified on 26 October 2015, at 08:52.